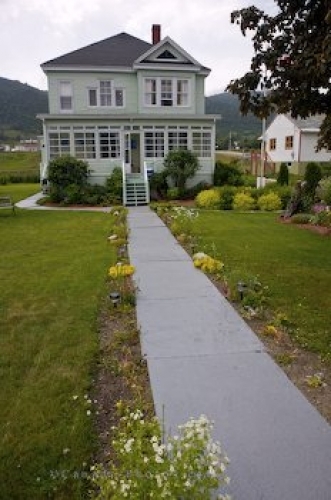 A historic home in Woody Point in Newfoundland, Canada is part of the heritage which surrounds this beautiful town. Woody Point in Gros Morne National Park in Newfoundland, Canada is a town full of history and beauty with approximately four hundred permanent residents. This historic home is typical of the houses in the town and most of them have plenty of property to create a beautiful garden. The top half of the historic house has dated windows which add character to the house, and the lower deck is beautiful, being enclosed by a wooden frame. When visiting Woody Point in Newfoundland, Canada you can feel the calm and historic atmosphere which surrounds this town. Beautiful historic homes in Woody Point, Gros Morne National Park, UNESCO World Heritage Site, Viking Trail, Trails to the Vikings, Highway 431, Northern Peninsula, Great Northern Peninsula, Newfoundland Labrador, Newfoundland, Canada. Picture of a historic home in Woody Point in Newfoundland Labrador in Canada.